Bruce is guesting Joe Ely. 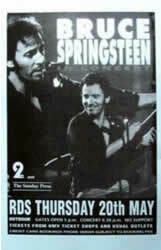 First ever Springsteen performances of "Blowin' Down This Road", "Fingernails" (which includes a snippet of "Buddy Brown's Blues"), and "Settle For Love". Concert To Fight Hunger to benefit World Hunger Year, The Food & Hunger Hotline and The Community Food Bank Of New Jersey. A night of many guests: Joe Ely plays guitar and sings on "I Ain't Got No Home", "Settle For Love" and "Blowin' Down This Road". 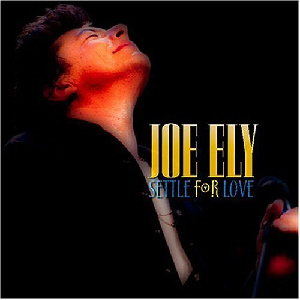 "Thank you....I´d like to bring up a friend of mine, uh, we met in Ireland....we just finished a couple of months playing in Europe and uh....we were in Dublin one night and I came and played his show, he came and played at mine, he´s a great, great, great rocker out of Texas, Mr. Joe Ely, gonna come up and sing a song..."
Settle for love is played with Joe Ely. Also played that night were first performances in Europe of "All Just To Get To You" and "Oh, Boy! ", as well as "Long Tall Sally". "Fingernails" is played in a medley with snippets of "That Black Snake Moan", "Matchbox", and "Buddy Brown's Blues" .